Do you enjoy working with people of all ages? Do you have a love of plants and nature that you would like to share with others? 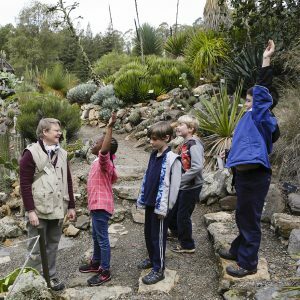 Become a docent at the UC Botanical Garden. We educate thousands of school children and adults each year about plants and the natural environment. 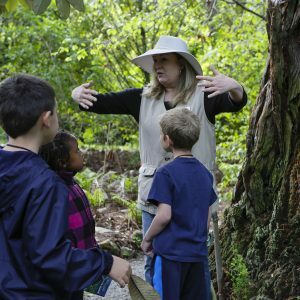 Our docents create memorable and exciting learning experiences for small groups of school children, university students, and the general public. Training is provided by the Garden’s expert horticultural staff, experienced docents, and by plant specialists from UC Berkeley and the community. Upon successful completion of the training program and requirements, the commitment for leading tours is a minimum of two tours per month for at least two years post graduation. The seven-month course meets weekly on Mondays from 1:00-4:00pm, starting in September 2019. Docent training is conducted every other year. If you would like to receive information about our Fall 2019 program, contact our Volunteer Coordinator at perry@berkeley.edu or call 510-643-7265. The Garden has many other volunteer opportunities. The Roving Ambassador program is recommended as a way to get familiar with the Garden before enrolling in Docent Training. For more information visit our Volunteer Page.